Rashtriya Chemicals & Fertilizers (RCF) has informed that it has recorded a steep drop of 23.36% in the net profit on standalone basis for the quarter ended March 2009. The company has reported a net profit of Rs 393 million during the quarter under review as compared to Rs 513 million in the same period last fiscal. However, company's net sales for same period has witnessed a growth by 43.88% which stood at Rs 19128 million as against Rs 13295 million in the same quarter previous year. For the financial year ended March 2009, the company has registered a net profit of Rs 2115 million, up 33.78% from Rs 1581 million in the same period a year ago. Further, the board members of the company have recommended a final dividend at Rs 1 per equity share to the shareholders of the company for the year 2008-2009. 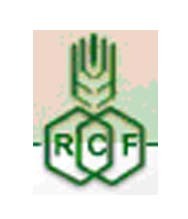 Rashtriya Chemicals and Fertilizers Limited (RCF) is a public sector company which engages in the production of fertilizers and basic chemicals for agriculture.